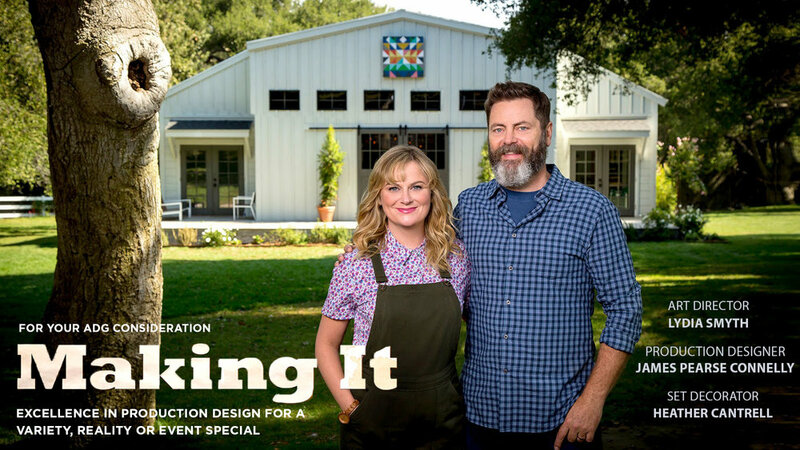 On NBC's Making It - a show featuring skilled craftspeople competing in different mediums - the production design softens the line between indoor and outdoor by inviting nature and creativity into the space. The light filled, nature-inspired craft barn serves as the beautiful, clean structural backdrop from which the handmade projects are showcased. The barn is open, airy, modern and adorned with simple but impactful architectural details such as raw wood beams, white stained walls, and vaulted ceilings. An open "greenhouse workshop" lives a short distance away from the barn and houses the power tools / serves as a space where specific craft projects take place.